The Acton-Boxborough Food Service Department is excited to serve healthy and delicious breakfast and lunch to all students in the district. Breakfast is available at all schools 20 minutes before the start of the school. All lunches include an entrée, choice of milk, fruit, and vegetable. Sign Up Here for the Early Release Lunch Program for Extended Day Students. You can order lunch by the end of day Sunday prior to the Thursday early release day. Our Fall 2018-2019 Newsletter includes breakfast and lunch prices, how to prepay meals online or by check, and a link to the online application for free or reduced lunches. Read our letter to Kindergarten parents! Remember, lunch is available only for full-day Kindergarten students. Let's Move is a comprehensive initiative, launched by the First Lady, dedicated to solving the problem of obesity within a generation, so that children born today will grow up healthier and able to pursue their dreams. 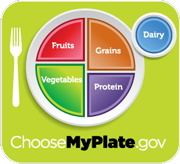 Choose My Plate from the U.S. Department of Agriculture gives advice on nutrition, MyPlate, MyPyramid, and Dietary Guidelines for Americans. The Food Services Department offers School Café, a safe and secure way for parents to make online payments and view student meal account activity. For details, see Prepay Meals Online. We provide an online application for free and reduced meals. Printed forms are still available. For more information about printed or online forms, see the free and reduced meals page. If you qualify for reduced meals, breakfast costs $0.30 and lunch is $0.40. We recommend downloading the menus and forms in one of these browsers: Chrome, Safari or Firefox.